America's first world champion, Phil Hill would probably have achieved more had he not switched to the ill-fated ATS operation at the end of 1962. Hill, who also carved out a successful sportscar career, demonstrated himself to be a good team player when he moved aside at the 1958 Moroccan GP to enable Ferrari team-mate Mike Hawthorn to take the title. He was rewarded with a full-time drive and took his first GP win at Monza in 1960 after the British teams boycotted the banked circuit. 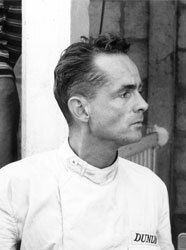 It's often said that only the death of Wolfgang von Trips allowed Hill to take his title in 1961, but he had been evenly matched with his team-mate and was still a threat when the German made his fatal mistake at Monza. There were no more F1 wins, but Hill would go on winning sportscar races until 1967. Should Phil Hill be higher or lower in F1's greatest drivers?